Virgin Blue now rebranded as Virgin Australia is a low cost airline of Australia with its main base in Brisbane, Australia. 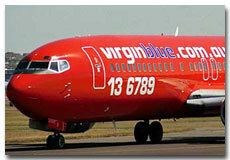 Virgin Blue is one of the most famous low fare carriers of Australia. It provides air flight services to many Australian domestic destinations along with various international destinations. Now book Virgin Australia flights Tickets reservations online in simple steps here and plan air trip with flights schedule and status. You can also book cheap flight tickets for Virgin Blue Airlines Australia online now. Virgin Blue Airlines was founded in 2000. Initially they got two aircrafts leased from Virgin Express. Virgin Australia started operations by offering flight services between Brisbane and Sydney.